2. Brush a small amount of olive oil onto both foils. 3. Place fish on top of the foil followed by tomato slices, red onions, 1 tsp. of olive oil drizzled on top and a pinch each of the 3 herbs. Season with salt and black pepper. 4. Wrap the foil up and place on the hot grill for 3 minutes. 5. Flip and grill for another 3 minutes or until done, depending on the thickness of the fish. 6. 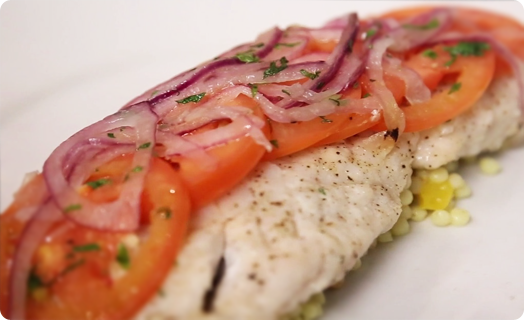 Serve on top of a bed of Israeli Couscous and enjoy!